This pair of Sacred Cat Earrings is a reproduction of a faience (glazed earthenware) amulet and is made with gold covered pewter. They measure 1 1/4" high and 3/8" wide. HISTORY:Cats were considered sacred in ancient Egypt. Admired for its virility, strength and agility, it was also the symbol of Bastet, the benevolent cat goddess who represented motherhood and joy. She was often portrayed as a woman with a cat's head. Bubastis, a city in Lower Egypt, was famous for its yearly festival in honor of Bastet and for its great cemetery of mummified cats. 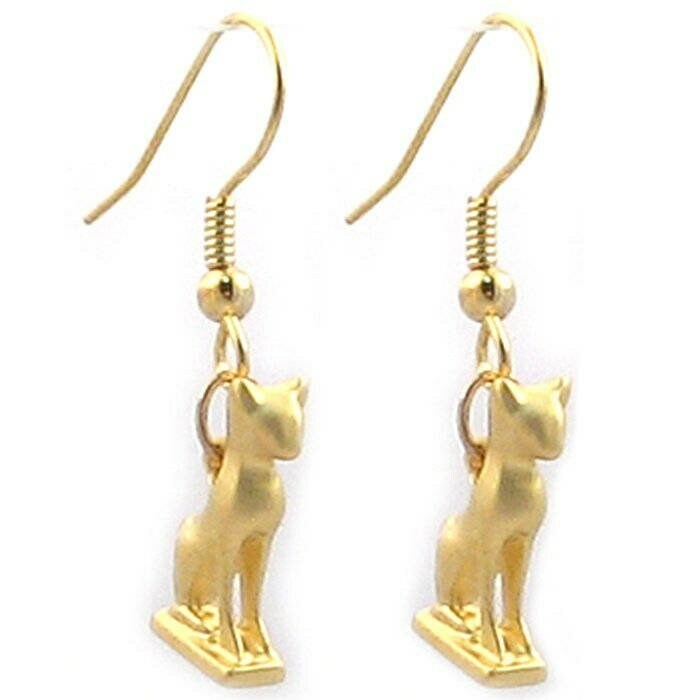 Cat amulets were commonly worn on necklaces during the 22nd and 23rd dynasties to invoke the blessing of Bastet.